I've been wondering if there is a way to get more information on T. Keith Glennan, first director of NASA. Dear Citronbleu, I thank you for reminding me to look a bit further into the T. Keith Glennan character. As it is, I just bumped into this most interesting 'nugget' regarding the man's pre-NASA appointments (aside from his many years as studio-production manager for major Hollywood studios). "He [T. Keith Glennan] advocated building a formidable defense capability and constructing a powerful nuclear deterrent force as the best hopes for ensuring the nation's peace." As it turns out, in 1950 Glennan was nominated "commissioner for the U.S. Atomic Energy Commission". In the book "The Birth of NASA - The Diary of T. Keith Glennan" (of which I have selected a few extracts below), we learn that during Glennan's 25-month tenure as commissioner of the Atomic Energy Commission, "the most significant issue the AEC became involved with was the development of the hydrogen bomb." That occasion came while he was on vacation in the summer of 1950, when Glennan called back to CIT and learned that the White House had been trying to reach him. Glennan found that outgoing Atomic Energy Commission (AEC) member Lewis L. Strauss had given his name to Donald Dawson, a Truman aide who was looking at candidates to serve on the AEC. Strauss had been Herbert Hoover's private secretary in the World War I era, became a successful Wall Street businessman in the 1920s, and turned his attention to philanthropic enterprises associated with scientific research in the latter 1930s. A member of the Naval Reserve since 1925, he had served as a Rear Admiral in World War II as a special assistant to Navy Secretary James V. Forrestal. During the war he had also learned of Glennan's work at the Naval Underwater Sound Laboratory, and when the time came to seek a replacement for his own seat on the AEC, Strauss remembered the 45-year-old Case president. While some of the Democratic congressmen involved in the search preferred the appointment of AEC General Counsel Joseph A. Volpe, Jr., Strauss used his connections in the White House and the Pentagon to gain Glennan's appointment. Glennan brought to the job, as the official history of the AEC commented, "a solid business background, some experience in Government, and a great interest in the role of science and technology in modern industry. After speaking with Dawson, Glennan visited Washington to learn more about the AEC position. He recalled that he met Dawson in the White House, where he was briefed on the activities of the Commission. Glennan told Dawson that he would wait to hear from him about whether or not President Truman wished him to serve. As he was preparing to leave, however, Dawson said, "wait a minute, Mr. Glennan, I think the president wants to see you." Dawson took Glennan into the Oval Office where he met the president and they spoke briefly about the AEC. Glennan allowed that he was not particularly well-qualified for the post, but Truman responded with a "I'm not sure you're the best judge of that". Following this discussion, Truman sent Glennan's name to the Senate for confirmation as one of five commissioners for the AEC. Glennan testified before the congressional committee handling the nomination on 16 August 1950, was confirmed handily, and began work for the AEC in Washington on 1 October. He served on the AEC for the next twenty-five months. Probably the most significant issue the AEC became involved in during Glennan's tenure was the development of the hydrogen bomb. Glennan resigned from the AEC on 30 October 1952, and the first hydrogen bomb test took place at Eniwetok Atoll in the Pacific Ocean on 1 November 1952. Needless to say (to this forum's readers), this goes to corroborate what we have long been exposing on Cluesforum, i.e. that the "Atomic bomb" and the "Space race" are both phony (and intimately intertwined) state-sponsored hoaxes sold to the public with the aid of totally artificial "Hollywood-grade" imagery. From time to time, I feel it's important to remind everyone just how much BS emanates from the government agency known as 'NASA'. Here is a fine video by "HowIseeTheWorld" which I'd recommend everyone to show to all newcomers to the (total) NASA fraud. His soft-spoken, no-nonsense commentary should make for a great introduction to anyone who still believes in the reality of space travel, in any way or form. I find it comforting to see that, in spite of the NASA Propaganda Department's million-$-effort to discredit those awakened to the BIG NASA FRAUD by associating them with the 'viral' Flat Earth BS campaign (of their own making), there appears to be a growing number of thoughtful / articulate NASA critics emerging on the internet - on Youtube and elsewhere. Back in 2009, as we started here at Cluesforum our methodical deconstruction of the massive / total NASA fraud, the only NASA skepticism to be found was limited to the Apollo Moon Landing TV hoax (1969-1972). I think we can be proud of our patient, collective work over the years - as it may well have been instrumental in (logically) extending the discourse to encompass ALL of NASA's purported space operations - exposing them for the total, taxpayer-funded scam that they (and space travel in general) are. Simon, your video is not showing - states that it is not available. CluedIn » December 6th, 2017, 10:38 pm wrote: Simon, your video is not showing - states that it is not available. Too bad - looks like the HowIseeTheWorld YT channel is gone. NASA counts down to launch of first spacecraft to 'touch Sun'! The 65-minute (11) launch window opens at 3:33 (9) am (0733 GMT), and the weather forecast is 70 percent favorable for takeoff, NASA said. The probe's main goal is to unveil the secrets of the corona, the unusual atmosphere around Sun. Not only is the corona about 300 times hotter than the Sun's surface, it also hurls powerful plasma and energetic particles that can unleash geomagnetic space storms and disrupt Earth's power grid. The probe is protected by an ultra-powerful heat shield that is just 4.5 inches thick (11.43 centimeters). The heat shield is made of two panels of superheated carbon-carbon composite sandwiching a lightweight 4.5-inch-thick carbon foam core. 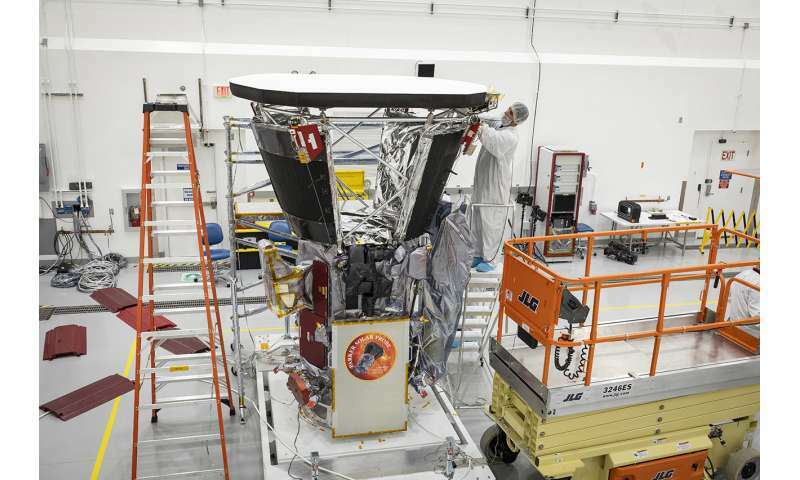 The Sun-facing side of the heat shield is also sprayed with a specially formulated WHITE COATING to reflect as much of the Sun's energy away from the spacecraft as possible. The heat shield itself weighs only about 160 pounds—here on Earth, the foam core is 97 percent air. Because Parker Solar Probe travels so fast—430,000 miles per hour at its closest approach to the Sun, fast enough to travel from Philadelphia to Washington, D.C., in about one second—the shield and spacecraft have to be light to achieve the needed orbit. Just posting a little comedic video from our favorite space propagandist, to brighten and lighten your day ! Cheers and enjoy the laughs ! Last edited by CitronBleu on Thu Sep 13, 2018 9:13 am, edited 2 times in total. Enabled by Newton's Law of Physics from the 17th Century when Witches were being burned at the Stake.